The following provides a starting point and understanding of some of the key issues relevant to this practice. Photomontages use photographs of an actual scene modified by the insertion of an accurate representation of the visible changes brought about by a proposed development. Properly constructed photomontages can serve as a useful means of indicating the potential visual effect of a future development, and should be easily understood and usable by members of the public and those with a non-technical backgrounds. ‍The landscape professional should select a set of photographic viewpoints which are considered representative of the range of likely effects, viewing experiences and viewers, ensuring that none are under or over represented. Viewpoints should be agreed with the regulatory authority or authorities where possible, and with other parties as considered necessary. The term ‘field of view’ is used to describe the height and width of a view as represented by an image. These constitute the horizontal field of view and vertical field of view and are expressed as angles in degrees. The proposal under consideration and its relevant landscape context will determine the horizontal field of view required for photography and photomontage from any given viewpoint. This will in turn determine whether a single-frame image or a wide-angle lens will suffice or whether a panorama will be required. The camera may also be used in portrait orientation (rather than in landscape orientation) for panoramic creation as well as for single-frame images. In the past it was regarded that a panoramic image of 124 degrees horizontal field of view x 55 degrees vertical field of view be the standard requirement for Visual Impact Assessments because it was relative to the human primary field of view. While this may be preferable in some cases, the panoramic field of view does not need to be confined to these limits. The field of view will tend to vary on site, and will depend on capturing different and challenging landscape situations like tall buildings, steep mountains or where a telecommunications tower would appear. The horizontal field of view is usually more relevant to representations of rural and peri-urban landscapes and the vertical field of view may be more important in urban landscapes. Two-dimensional photographic images and photomontages alone cannot capture or reflect the complexity underlying the visual experience, and should therefore be considered an approximation of the three-dimensional visual experiences that an observer would receive in the field. Also when printed the images will not replicate the same range of colour or contrast. Furthermore human sight is not static, thus the horizontal field of view naturally turns as the eyes turn. Turning the eyes far from their central position is uncomfortable, so we tend to turn our heads and if necessary our whole bodies to take in a wide view. Figure 01: Basic Visual Data. There have been suggestions that the horizontal field of view shown in visualisations could be linked to the physical limits naturally seen by a human eye. However it is difficult to derive definite parameters in this way, as a human has an extreme horizontal field of view of about 200°, yet only the 6-10° that falls on the central part of the retinas of the eyes will be in focus at any one time. The limits upwards and downwards are defined by an individual's skull configuration, but 50-55° upwards (limited by eyebrows) and 70-80° downwards (limited by cheeks) are a good average. Within that very large overall visual field, only a very small central area will be seen in detail. Great change in all aspects of photography, 3D design software and photomontage have taken place over the last decade. 35mm colour roll film and the associated cameras and lenses have been almost completely supplanted by digital cameras. Remarkably a 35mm film has only a resolving power about equivalent to a 9 megapixel digital sensor, and a standard DSLR 12 megapixel camera will potentially capture far more detail than was ever possible with a 35mm SLR film camera. Just as with film, digital camera sensors are limited in the range of contrast they can capture, therefore similarly imposing limits on the detail that can be seen. Photomontages should be based on a good quality photographic imagery taken in representative weather conditions and wherever possible the camera should be tripod mounted and levelled in horizontal and vertical axes. All relevant photo data should be provided to enable the parameters of the simulations to be verified, similarly, the methodology by which the image was produced. The use of a 50mm focal length lens as a reference standard, while still valid, is now somewhat outdated and misinformed. Photomontage creation should not be restricted to only a 50mm focal length. The width of view and lens selection should vary depending on the project requirements, the specific key characteristics of the view and the extent of the proposed activity. The key photomontage parameters are accurate scale (at a specified reading distance) and field of view –not lens focal length. Camera manufacturer’s now offer a wide variety of different fixed focal length lenses which are free of distortions and other defects. A range of different field of views are available between 111 degrees (12mm lens) to 40 degrees (a 50mm lens). Photographs shot using a 17mm or a 28mm lens for example capture a far greater portion of the primary human field of vision. The recommended viewing distance of between 300mm and 500mm for printed or digitally displayed images can still be achieved using these lenses and many other types. The lens focal length will also have less significance when assembling a stitched panorama comprising of several single-frame photographs to form a greater field of view. If a practitioner stitched together two separate panoramas to form the same field of view, in one case using a 50mm lens and in the other a 24mm lens, the end result would be the same. The only difference between each image would be the number of individual frames spliced together to form the panorama. The photograph examples above were shot from the same viewpoint location and direction-of-view using three separate lenses of varying focal lengths -17mm, 24mm and 50mm. When all three photographs were overlapped correctly the content is exactly the same, the lenses perspective was determined by field of view, not by the lens focal length. All photographs, whether printed or digitally displayed, have a unique, correct viewing distance - that is, the distance at which the perspective in the photograph correctly reconstructs the perspective seen from the point at which the photograph was taken. The correct viewing distance should be stated for all printed or digitally displayed photographs and photomontages, together with the size at which they should be printed. Whenever possible a consistent viewing distance should be used throughout a document and some indication stating whether the image is a single-frame or panorama. 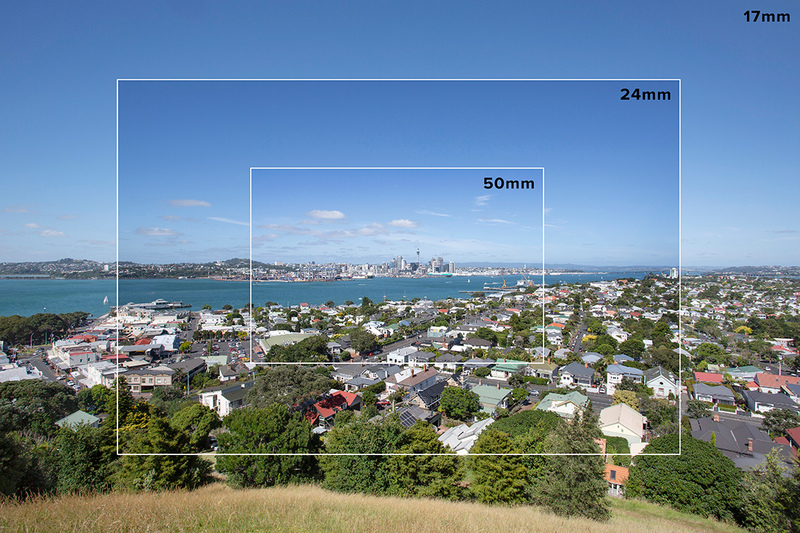 A comfortable viewing distance for hand-held photomontages should be between 300mm and 500mm. There are advantages in printing at larger sizes as well which results in portraying greater detail, particularly photographs and photomontages used for exhibition display. The viewing distance may be larger than 500mm in this case. The viewing distance and the horizontal field of view together will determine the overall printed image size. A panoramic image will have a constant horizontal scale, however a single-frame image has a scale increasing radially from the centre. The calculated distance will therefore only be correct at the centre of a single-frame image and will increase towards the sides of the frame. Panoramic images can either be curved (cylindrical projection) so that peripheral parts of the image are viewed at the same intended viewing distance, or viewed by panning across a flat image (rectilinear projection) with the eye remaining at the recommended viewing distance. Figure 03: The relationship between image size, reading distance and the ‘real-life’ view. In the field, the correct viewing distance is easy to establish, as a viewer can adjust the position of a hand-held visualisation until it appears to correspond with the scene beyond. Very simply, if the photograph is held too close to the eye, the elements in the scene will appear too big; if it is held too far away, the elements will appear too small; and there is only one distance at which the photograph will match the real scene (the correct viewing distance). Figure 04: Use of a comfortable reading distance. At a comfortable reading distance of 330mm compared to 500mm the viewer can alternate their view between the existing landscape and the photomontage, easing direct comparison and thus judgements on the proposed effect. At a short reading distance (500mm or less) the viewer can only either see the photomontage in front of them, or the existing view – not both. Thus direct comparison is less easy. The printed size of an image is independent of the focal length. If an image is defined in terms of its horizontal field of view and its correct viewing distance, then those parameters uniquely define the printed size. (References: Landscape Institute and IEMA London (2002) Guidelines for landscape and visual impact assessment. Advise Note 01/).